Gotham Spoilers provide the episode 4 synopsis for ‘Arkham’ along with a sneak peak preview video. 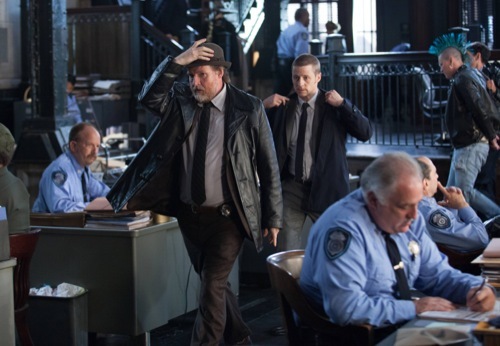 We also present a detailed review and recap of episode 3, “The Balloonman.” According to FOX, “A political vote shakes Gotham City on an all-new “Gotham” Monday, October 13. As a contentious city council vote on the future of the Arkham district approaches, politicians from both sides are in danger. Gordon and Bullock must race to protect the council and an old friend visits Gordon in the all-new “Arkham” episode of GOTHAM. There is a news report about a man who is going on trial, his name is Ronald Danzer. When he leaves his office he is taken by a man in a Saw like pig mask and handcuffed to a weather balloon. He sends him up up and away. Later he does the exact same thing only this time we get to see the guy come back down and land on a old lady. They both paint the sidewalk red. Gordon is meeting with Lt named Cranston. Gordon lets Harvey know he thinks he is a thug. Gordon wants to check out Danzer. Harvey thinks it’s a waste if time. Salina shows up to see Gordon. Salina takes Gordon to where she saw the murder take place. Gordon can’t decide if she is lying or not. Salina tells him she stole a guys wallet and dumped it here. Gordon cuffs her. He takes a look around and funds the wallet. Gordon knows she was telling the truth. In the meantime Salina has gotten free from the cuffs and taken off. Allen and Montoya head over to see Mooney. They ask her Oswald is. Mooney doesn’t know. They tell her they know he is dead. Mooney tells them she thinks Gordon killed him. Mooney them tells Them that Falcone is the one who put out the hit. Oswald is chilling like a would be villain on the streets of Gotham with a knife. Someone comes up to him and informs him Mooney would pay hella good money to get her hands on him. Oswald kills the guy and then takes all his money and heads of to buy something to eat. Alfred and Bruce are pretending to sword fight with canes. Alfred learns that Bruce has the police file on his parents death. Bruce isn’t to confident that Gordon will find the guilty party. Allen and Montoya ask Gordon point blank if he killed Oswald. Gordon tells them no and the. Points out they have have no proof of anything. Oswald goes to see about a job in a restaurant. He is told no by the boss because he doesn’t have the right shoes. Oswald then spots the right shoes on someone else. Harvey and Gordon have a chat about Oswald and his murder. Oswald goes up to the guy with the shoes and ask what size they are. He tells him they are a nine. Oswald marvels at the coincidence and laughs. Gordon finds out that four balloons were stolen. Cranston being the dirty cop he is decides to lay the smack down on some guy for his money. The Balloonman tries to handcuff him. Cranston starts beating him. It makes no difference he still goes airborne. Bruce shows Alfred the newspaper story in the Balloonman. Barbara wonders if Gordon is safe with the Balloonman on the loose. Meanwhile the people of Gotham absolutely love our pig mask wearing friend. Mostly because he kills people who are corrupt. The Captain is demanding answers. He wants them to figure out who the Balloonman will go after next. Harvey questions the criminals on the streets of Gotham. Oswald has the job and not surprisingly the shoes to go with it. Oswald’s boss is in the middle of chewing him when Maroni comes breezing in. Gordon and Harvey are still talking to got hand most wanted. When they get to Carl Smikers the girlfriend tells him to take off. They catch him after a brief struggle with Harvey. Lazlo goes to mooney and tells her he is worried Falcone will have him roughed up again. Mooney tells hi that no such thing will happen. After Lazlo leaves Mooney tells one of her men to get rid of Lazlo. She also wants him to have Falcone’s girlfriend beat up. Montoya goes to see Gordon. Montoya implies Gordon killed Oswald. Barbara uses the liar liar pants on fire defense. Barbara ask Montoya to leave. Montoya tells Barbara to ask Gordon where he was the night Oswald was murdered. Carl tells Harvey and Gordon that he sold the balloons. He also tells then that they will come back down and boy do they ever. Harvey ends up finding a list of names and Gordon’s is on it. Gordon realizes who the Balloonman is. Maroni is if den a fake name by Oswald. Maroni hands him some money. The news is showing a story about a priest that was sent into space by the Balloonman. Gordon tells Harvey the man they gif Selina from is the Balloonman. Gordon fills In the Captain. Harvey can’t fund anything but Gordon knows where to go. The arrive and see a gate is open. The guy tells Gordon he just wanted to make a difference. Harvey handcuffs the guy to a balloon and starts to send him up. Gordon grabs him which leaves Harvey with no choice but to shoot the balloon down. Falcone comes to see Mooney. He wants t make sure there are no hard feelings between them. Mooney wants to know about his girlfriend. Falcone tells her she had a accident. Falcone lets Mooney know he will hurt the person who hurt her as well as anyone who helped them. Balloonman is going to be taken to the hospital. Gordon ask him who the last person in his list was. Bruce sees the story about the Balloonman being captured. Gordon returns home and tosses his jacket down. Barbara hugs him and ask if he is ok. Barbara tells Gordon she loves him. Someone knocks and she goes to answer the door. It’s Oswald.